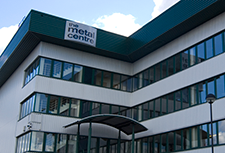 Maintaining the security of your data is very important to The Metal Centre. We are committed to respecting data privacy rights. We pledge to use your data fairly and legally. We will be transparent with what we do with data, what we collect and how we use it. The Metal Centre receive data in a number of ways, including but not limited to website activity, marketing sources and exhibitions. Service providers handling data we share with them will have been subject to appropriate data protection and security checks. Contractual obligations on service providers are also in place to ensure data is only used in order to provide the appropriate services to The Metal Centre.